SYNOPSIS: This is a startling and powerful film set entirely within the confines of a modern maximum security prison. 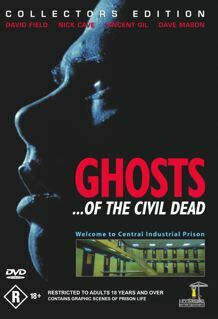 It goes beyond the traditional prison film themes of good and evil to draw a frightening allegorical portrait of the nature and organisation of our society. On release this film caused heated debate worldwide. This is the first feature by Australian Director John Hillcoat who has worked closely with Nick Cave on a number of projects including The Proposition and The Road. Cave composed the music for Ghosts with Mick Harvey and makes an unforgettable screen debut as the crazed Maynard. The DVD extras include world exclusive interviews with Cave and an extraordinary insight into the creative process he uses to develop his writing and characters. These DVD copies are the last original copies. There will be no more made. The rest are all pirates. The DVD, authored by Haydn Keenan from Smart St. Films, brings together the most comprehensive collection of DVD extras ever assembled for an Australian film. Once these copies are sold that's it. The Producer has indicated there will be no more made. "The most powerful film ever to come out of Australia." - Andrew Urban, The Age.